I had long been excited for this meeting. 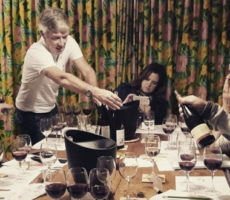 ‘Vertical tasting’ is one where wines from successive vintages, usually consecutive ones, are tasted and compared side-by-side. They are usually offered at specialist tastings and typically for red wines with their more pronounced ageing process. 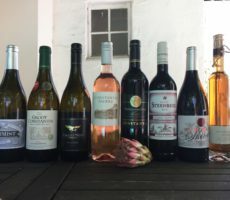 I had never undergone a ‘vertical tasting’ of white wines. 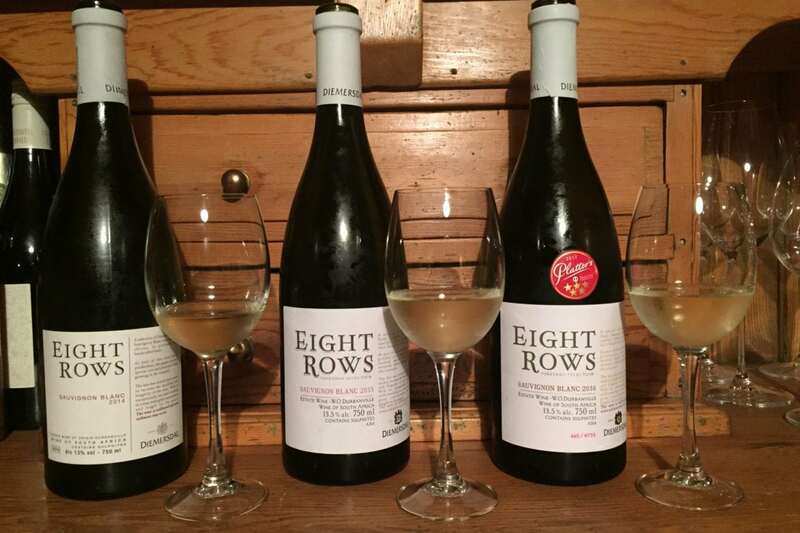 The 8 Rows Diemersdal Sauvignon Blanc offered the perfect opportunity and one too good to miss. This was not only the same wine from the same block on the same wine estate but, as the name suggests, a wine made from the same 8 rows within that block. It was the closest comparison possible. 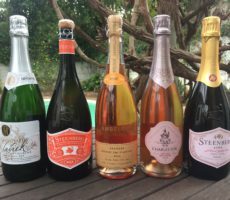 Differences in taste could nonetheless be due to a number of factors: weather, wine-making and ageing, to name but a few. The wine was poured and we started to compare – appearance, nose, and then palate. There was agreement that the wines were not the same but opinions differed on what the differences were. The 2014 vintage was noticeably more pale gold in colour than the pale straw of the 2015 and 2016 vintages. It was also distinct in its nose whereas the 2015 and 2016 vintages were closer to each other. The 2014 version had a warm nose, of brighter citrus than herbaceous notes, perhaps even with woody undertones (oddly so since it is unoaked), and a mellow mouth feel. 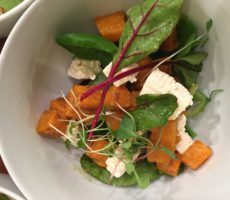 The 2015 wine was more grassy and herby on the nose, with green lemon, lime and gooseberry complexity, with moderate acidity and a lingering finish. 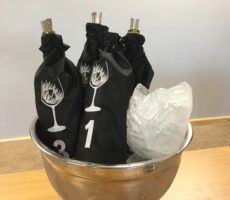 By comparison, the youngest (2016) vintage was fresh and lively. Notes of green grass mingled with zesty lime and green lemon. It was crisp and flinty on the palate and with a shorter finish than the older vintages. Seasonal differences between the 3 years were distinct. 2014 had a cool, wet winter and pre-season. It was unusually cool. Lighter, less powerful wines were produced but with the potential for fine concentration and elegance if the grapes were picked judiciously. A year later, in 2015, near perfect conditions produced a smaller but pristine crop of exceptional quality. 2015 is expected to be one of the great vintages (possibly surpassing 2009). 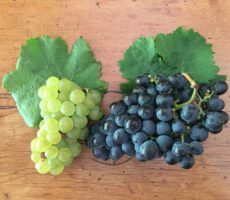 2016 was a challenging year, being exceptionally hot and dry, with later-ripening varieties (usually these are the red grapes) benefitting from lower temperatures. Wow! We each had our own opinions and conclusions, the biggest of which was how different and distinct each vintage was. The extent of the variation surprised me and fascinated. Our discussions and deliberations continued into the evening. 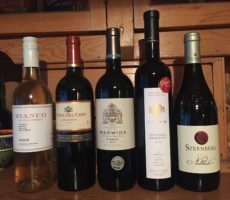 The ‘Big 5’ red wines gave the opportunity to taste and learn the characteristics of each of the major grape varieties in South Africa: Pinot Noir, Merlot, Cabernet Sauvignon, Pinotage and Shiraz. 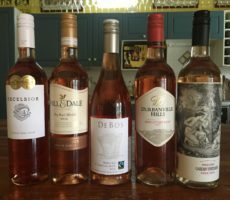 My guests were obvious wine aficionados and so my task was easy. Learning from them too about their experiences at vineyards I had not visited or wines drunk was a treat too. 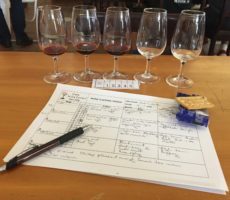 The flavour chart – grouping red wines into Red-Berry, Black-Fruit and Spiced-Fruit families – proved useful again. 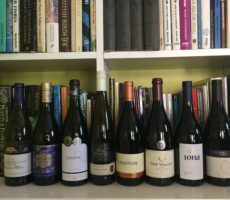 Pinot Noir, light, red-berried and often with sourness, is not everyone’s favourite and perhaps an acquired taste. The Glenelly Merlot was smoother than most and showed the typical notes of cedar and cigar box. I liked the Simonsig Cabernet Sauvignon which was typically full bodied and robust. 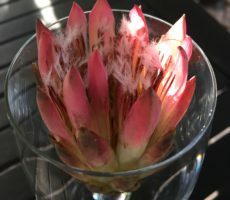 The Pinotage from Beyerskloof – a well known classic – was better than expected, having drunk some pretty average ones at the recent Pinotage and Biltong Festival, showing spicy fruitiness without too much acetone notes. 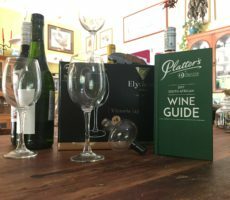 Deep ruby to purple in colour, and full bodied, the Delheim Shiraz was characteristically spicy with good fruity complexity. Everyone had their own favourite and their own opinion. As ever, it is fun to listen to others and to compare one’s own findings and preferences. Conversations continued long after the cheese board was served as we returned to sample different wines again. I mused after that my aims to share, broaden, learn and explore wine in a fun and comfortable setting were truly met.